I was so happy I found this thing! I had no idea this book existed despite the fact that it holds short stories from some of my favorite authors. I ran across this gorgeous beast when rummaging around a used bookstore, you know, the best way of finding new books known to man. 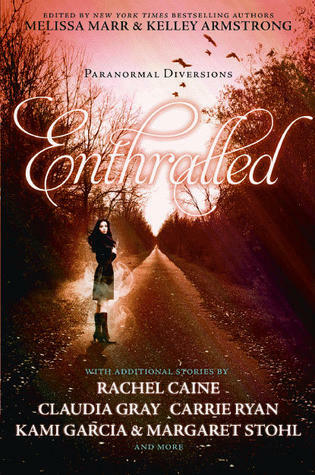 In all honesty, Enthralled was sheer perfection for an anthology. Not only was each story centered around a specific theme – though each had their own twist on the topic – the stories actually felt like stories. They were complete, heartbreaking, uplifting, and the perfect thing to get me through my week. This little story… just… aww! It was so cute, adorable, and any other adjective you can think of that reminds you of snuggling with puppies. This one is mostly about a set of twins realizing they have abilities and coming to terms with them, as it were – BUT, there is a sweet little twist included. Just.. just read it and swoon with me, yea? I’d never heard of Carrie Ryan before reading this, but now I am so glad I found her! While this wasn’t my favorite short story in the bunch, it is definitely up on my list simply because it was not what I was expecting – in a good way. This story focuses on family and how certain people are willing to go to horrible lengths to protect the people they love. I think I liked this one because it carried such meaning in an itty bitty space. This was so cool. Plain and simple. I’ve never read anything by Pearce, and that means I did not read the story this is based off of – but that’s besides the point. Things About Love was almost cutesy fun, at least in my head. It’s about a djinn trying to wrap its head around humans and love. It was awesome. Huh…that was.. interesting? No, I’m serious. I liked it, I really did – I just was lost I guess. This, too, is a connection to a book – but this one using actual characters and things from the series that just flew over my head. I will admit, though, that it made me want to go out and get the Soul Screamers series so I can see what was actually going on. I still liked it, don’t get me wrong – I just don’t like missing things. Oops. FINALLY! One connection to something else that I’ve actually read! Despite all that, though, this fell flat for me. It was sort of just underwhelming, and therefore disappointing. I had some pretty high expectations because I enjoyed Wicked Lovely and its interpretation of faeries. This just didn’t hit the bar for me. Should I feel bad? Also, be warned – if you haven’t read Wicked Lovely, this little tale is spoiler central. While I appreciate the constant satire on vampire stereotypes and the like, the lore and everything else about this sort story required some serious suspending of disbelief and common sense. It was just lacking that little bit of…. sparkle (See what I did there? DID YOU SEE IT!?!?) I’m serious, though, despite the Twilight joke. This story was just another bout of meh. This one… wow. Just wow. If you read this, and when you read this – get some tissues and therapy lined up. This is sad, compelling, and needed. It is about family, about learning to let go, and trying to decide when everything becomes too much. It had a very fitting format, it was the perfect mode to tell the perfect story. This one might take the cake, as it were. Why all the feels? Honestly, these last couple killed me, why did you have to join in? Ugh… this one cuts deep, and I mean deep. There is a lot in a little space, once again. This story really has something to say though, it has a purpose and it completely nails it on the head. Just close your eyes for a second and picture this: Flesh eating, zombie girl scouts and vampires dressed in so much drag they belong on Rue Paul’s Drag Race. This story is pleasantly surprising, entertaining, and everything else in-between. This short story was perfection. Just… agh! The feels, the romance, the setting – every little thing was amazing and I can’t figure out what else to say because it was so awesome. It was beautifully written. A short tale of love and sacrifice.. it deserves to be read. Morganville makes an appearance and my life is made. It is just that simple. Overall, this is a very good anthology – despite the few mishaps I noticed. If you’ve read the other works by these authors, you should be fine for the most part. Most of my issues stemmed from missing out on certain things or not understanding stuff – only one really missed my hit list because of bleh writing and the like. So, ENJOY!